Journalists tonight were surprised by the awards given out by the Cannes jury--a jury which included actors Kirsten Dunst, Vanessa Paradis and Donald Sutherland, and directors Arnaud Desplechin, Laszlo Nemes and George Miller. It's not that journalists found anything particularly off with giving Ken Loach's film I, Daniel Blake the top prize. The general consensus was that I, Daniel Blake was "very good." It's just that there were other exceptional films that journalists expected to win: namely, Maren Ade's marvelously creative Toni Erdmann and Kleber Mendonça Filho's unusually fresh film Aquarius. Some also expected at least some sort of prize for Jim Jarmusch's Paterson and Paul Verhoeven's Elle. 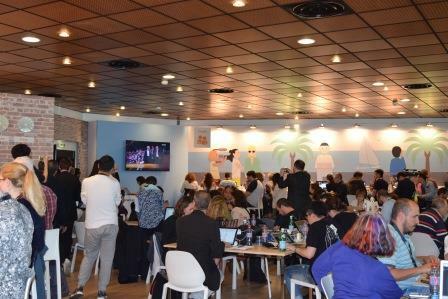 The awarding of Xavier Dolan's It's Only the End of the World for second prize (the Grand Prix) was met with boos in the third floor press room. Jury Member Laszlo Nemes defended the choice of Dolan's film: "You could feel the very specific voice of the director. I am very happy to see when people are trying to go in different and personal ways." The greatest surprise was the award for best actress to Jaclyn Jose in Brillante Mendoza's Ma' Rosa As a journalist objected to the jury: "But she was just in a supporting role." In a festival where there were so many extraordinary perfomances by women in leads, a common expectation was that the contest would be between Isabelle Huppert (Elle) and Sonia Braga (Aquarius). It is par for the course at the Cannes festival that the press is taken aback by the jury's decisions. What made this year different was that it was the first time in twelve years I heard boos directed towards the jury. Donald Sutherland stated pointblank: "We avoided looking at what other people were saying. It is unfair to me to say anything about which films were excluded or included." I personally was happy to see Asghar Farhadi get Best Screenplay for The Salesman (although there were others I would also vote for), and Cristian Mungiu share the Best Director award for his film Graduation.